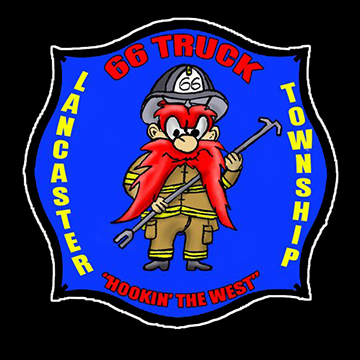 Truck 66 is a 1998 Spartan/LTI 93' Midmount Tower Ladder with a 6 man cab. 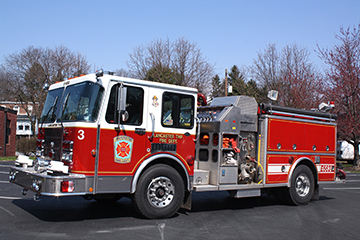 It has a Series 60 Detroit Diesel and an Allison World Transmission and a Hale 1500 GPM side mount pump. The truck's main emphasis is placed on tools, both hand and power but also has 200' of 5" supply line, 2 pre-connected 1" 3/4 crosslays as well as a 100' pre-connected line in the bucket. Some of the power tools carried include 2 Stihl 044 chainsaws with carbide blades, a Stihl rotary saw, a K12 rotary saw with a WORT HOG blade, 2 gas powered PPV ventilation fans, 2 electric fans and a 6 KW diesel generator. An extensive array of hand tools and ground ladders are also carried to facilitate search and rescue, ventilation, overhaul and salvage. It also is equipped with a thermal imaging camera, a CO2 meter and a heat gun. An AED is also carried as a QRS device for medical assistance. 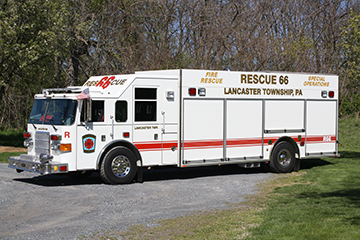 Engine 66-3 is a 1992 Spartan/American LaFrance with a 6 man cab. 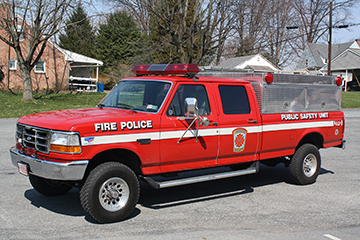 It has a Cummins 300 HP diesel with an Allison automatic transmission, a 1500 GPM Hale topmount pump & 750 gallon tank. Engine 66-3 is our structural engine/rescue assigned to the North station. The unit carries a light compliment of vehicle rescue tools including: cribbing, hand tools, air chisel and absorbent materials. In addition, it carries an Amkus rescue system with spreader, cutter and 2 midsized rams. For structural firefighting purposes it has 1000' of 5" supply line, pre-connected stepgun, deluge gun, "apartment" line, 3 crosslays and spare attack hose. The unit also has a TFT PRO PAC foam unit with 15 gals of foam on board, a 3000 watts of quartz lights and a GKW Onan generator. 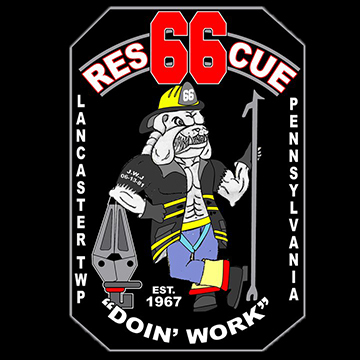 Rescue 66 is a 2006 Pierce enforcer walk-around style heavy rescue with seating for six. 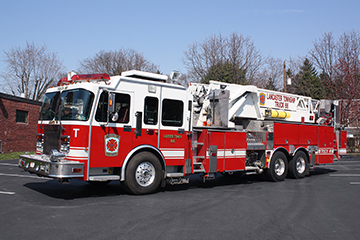 Originally owned by McCool fire and rescue Department of McCool, Maryland, the unit was purchased early in May, 2011 and was officially placed into service at 3:29 p.m. on Saturday, May 28, 2011 after a long day was spent by members to get equipment mounted and moved over from the old rescue. Major features of the rescue include a 450 hp Cummins diesel engine and Jake brake and automatic transmission, 35kw PTO generator, two independently controlled Will-Bert Night Scan light towers, four 6000 psi cylinder breathing air cascade with a Haskell booster pump and a two cylinder fill station, high and low pressure breathing air reels, 200 foot electric cord reels, an absorbent hopper (holding approximately 400 pounds of oil dry) and a 9000 pound bumper mounted winch, which can be moved to additional mounting locations on the other three sides of the vehicle. Powered rescue equipment includes an Amkus hydraulic rescue system and a Maxi-Force airlifting bag system. The Amkus system consists of both an electronically powered vehicle mounted power plant with a pre-connected cutter and spreader (each on 100 foot cord reels), and a gasoline powered, portable power unit with two 25 foot sections of pre-connected hose, giving the rescue the ability to run four hydraulic tools simultaneously in addition to the two pre-connected tools, there are two additional cutters and 3 rams. The Maxi-Force system consists of two sets of controllers and 20 various size airbags with a total of lifting capacity of more than 300 tons. 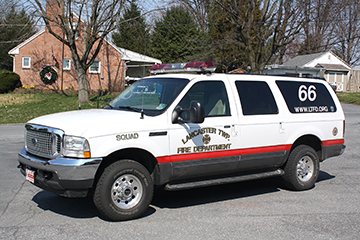 Squad 66-1 is a 2002 Ford Excursion and is housed at the South Station. This unit is used by the department for response to medical calls, extra manpower transport, and it is the primary vehicle to pull the boat trailer. It carries a BLS bag, AED, fire extinguisher, and miscellaneous equipment. Squad 66-2 is a 1992 Ford F-350 4 x 4, 4 door pick-up truck that is used as a traffic unit by the Fire Police and is housed at the South Station. It carries various traffic control equipment to include wooden barricades, cones, LED signals, and traffic barrels.